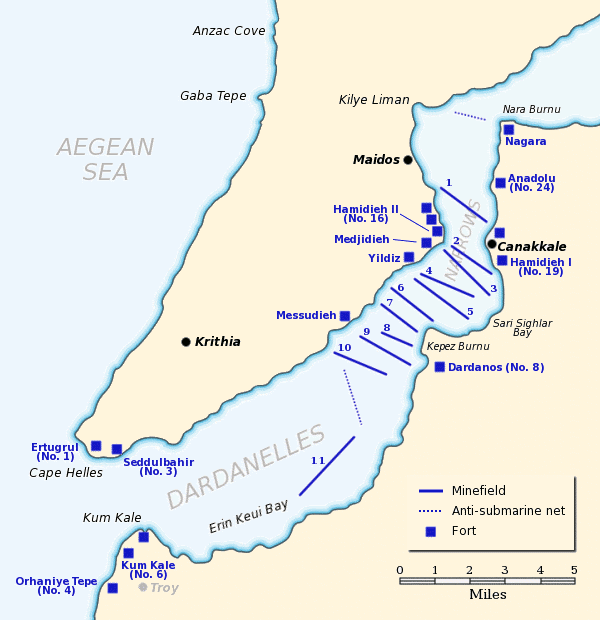 During the Allied naval attack on the Dardanelles, naval landing parties were put ashore to demolish Ottoman field batteries that had been abandoned temporarily by their crews. At 2:00 pm on 26 February the battleships HMS Irresistible and Vengeance were ordered to land demolition parties on the European and Asiatic shores of the mouth of the Dardanelles respectively. The latter, commanded by Lieutenant-Commander Eric Robinson, landed first because it had more to do. It was covered by a party of 50 Royal Marines under Major G. M. Heriot. Robinson’s party landed at 2:30 pm. It was to destroy the Kum Kale fort, the Orkanie battery, two anti-aircraft guns near Achilles’ Tomb and a damaged bridge over the Mendere River. The party advanced through an empty village without opposition, but then came under fire after reaching a cemetery. The heaviest fire was coming from a number of windmills on a ridge, which were quickly reduced to ruins by the light cruiser HMS Dublin. However, the left flank of the marines had been ambushed, with one man killed and two wounded. The main party came under crossfire, but pressed on towards Achilles’ Tomb, getting half way without loss. Robinson then decided that it was too dangerous for the full party, who were wearing white uniforms, to continue, so headed towards the anti-aircraft position on his own. The anti-aircraft guns were unmanned. After destroying one Robinson headed back for more explosives to deal with the other. By this time Dublin had reduced the Ottoman fire, so he took his men with him. They were able to destroy the other anti-aircraft gun and the mounting of the only surviving gun of the Orkanie battery. However, there was not enough time to deal with Kum Kale or the Menderes bridge. On the European side, Irresistible’s landing party found that four of the six guns at Sedd el Bahr were undamaged and destroyed them. However, the enemy was too strong to continue to Fort Helles, although two Ottoman 12 pounder guns were destroyed. The KING (is) pleased to approve of the grant of the Victoria Cross to Lieutenant-Commander (now Commander) Eric Gascoigne Robinson, R.N., for the conspicuous act of bravery specified below. Lieutenant-Commander Robinson on the 26th February advanced alone, under heavy fire, into an enemy’s gun position, which might well have been occupied, and destroying a four-inch gun, returned to his party for another charge with which the second gun was destroyed. Lieutenant-Commander Robinson would not allow members of his demolition party to accompany him, as their white uniforms rendered them very conspicuous. Lieutenant-Commander Robinson took part in four attacks on the minefields – always under heavy fire. In the meantime, Robinson had been involved in another act of heroism. In the early hours of 17 April the submarine HMS E15 ran aground near Fort Dardanos. The Ottomans opened fire on her before realising that she was aground. Lieutenant-Commander Theodore Brodie, her captain, was killed by a hit on the conning tower. A shell hit an ammonia tank: the fumes asphyxiated some of her crew and forced the others to abandon her. An attempt by an Ottoman destroyer to tow her off was prevented by bombing by British aircraft. However, it was clear that the Ottomans would make further efforts to move her, so the Royal Navy decided to destroy her. The submarine B6 tried to torpedo E15, but came under heavy gunfire and failed. At night, a further attempt was made by the destroyers HMS Grampus and Scorpion, but they were picked up by searchlights, came under fire and failed to find E15. On the morning of 18 April the submarine B11 was unable to locate E15 because of fog. It had cleared by the afternoon, so the battleships Majestic and Triumph attempted to destroy E15 by gunfire. However, the shore batteries meant that they could not get closer than 12,000 yards, at which range they were unlikely to hit such a small target. The next plan was to send in two picket boats, one from each of Majestic and Triumph on the night of 18-19 April. They were manned by volunteers and armed with a 14 inch torpedo each, Robinson was given command. The boats were caught by searchlights as they approached the Narrows. However, they were not hit and one of the beams accidentally showed the location of E15 for long enough for Majestic’s boat, commanded by Lieutenant Claud Godwin, to fire its torpedo. A large explosion was heard and a flash seen. Godwin’s boat was then hit by a shell, but the other boat was able to rescue her crew, although one man died of wounds. Aircraft reported the next day that E15 was now a wreck. All the men involved were awarded medals except Robinson, who was promoted to Commander, and the one who died, Armourer Thomas Hooper: the VC was then the only British medal that could be awarded posthumously. He was Mentioned in Despatches. Lieutenant-Commander Eric Gascoigne Robinson has been specially promoted to the rank of Commander in His Majesty’s Fleet in recognition of the distinguished service rendered by him on the night of the 18th April, 1915, as Commanding Officer of the force which torpedoed and rendered useless Submarine E.15, thus preventing that vessel from falling into the enemy’s hands in a serviceable condition, Dated 20th April, 1915. Lieutenant Claud Herbert Godwin, R.N. Lieutenant Godwin commanded H.M.S. Majestic’s picket boat, and was responsible for the successful shot by which the submarine E. 15 was destroyed after running aground. The other two officers involved both received the Distinguished Service Cross. Sub-Lieutenant (now Acting Lieutenant) Stephen Augustus Bayford, R.N.R., H.M.S. Majestic. Midshipman James Charles Woolmer Price. H.M.S. Ocean. These officers were both in command of picket boats on night of 13th-14th March. When Ocean’s boat lay helpless, having been struck in the boiler-room by a shell, Majestic’s took her in tow, under heavy fire, the conduct of these two young officers being altogether admirable, as was their handling of their boats. The citations for the award of the DSC to officers claim that the boats came from HMS Majestic and Ocean. However, those for the award of the Distinguished Service Medal to all the surviving petty officers and ratings of the boat crews agree with Naval Operations, the British Official History, that they were from Majestic and Triumph. Ocean had been sunk on 18 March. Possibly the second boat originally belonged to her but had survived the sinking, Midshipman Price may also have been a survivor of Ocean.. The recipients of the DSM, including two members of B6’s crew, are listed on naval-history.net. It also names six of E15‘s crew as having died; Naval Operations says six plus Brodie. The other 25 were captured; six died in captivity. Robinson rose to the rank of Rear Admiral and retired in 1933. He served as a convoy commodore in the first half of WWII before retiring again in 1942 on health grounds. J. S. Corbett, H. Newbolt, Naval Operations, 5 vols. (London: HMSO, 1938). vol. ii, pp. 163-65.